We (Daniel Maximilian and Thomas Pauli) are screenwriters. Over 70 of our screenplays have been aired on TV in Germany and other countries across the world. But most importantly: At least 50% of our royalties are going straight as a donation to Greenpeace and the non-profit Sea Shepherd Conservation Society which are struggling so hard to save the whales and the oceans. The courageous crews on the Sea Shepherd vessels are risking their lives combating illegal fishing, whaling, and seal-hunting. We must help them! 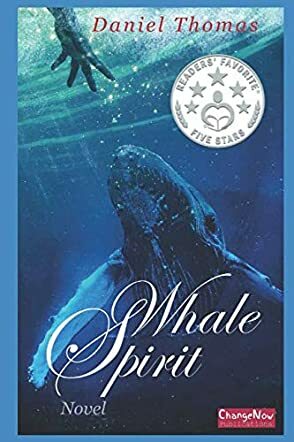 WhaleSpirit by Daniel Thomas is a spellbinding tale of adventure with a setting that is fascinating, plunging readers into life below the surface of the sea. A reporter who once took down one of the most influential men on Wall Street sets out for another bite of the man she humiliated when she hides her real identity and gets onto his whale research vessel. She quickly discovers that his life work has great meaning and that this research aligns with her values. This is a beautiful story that explores environmental themes and life beneath the waters; it’s a tale of love and betrayal, a story that creates the intersection between human life and the connection it has with other forms of life. Daniel Thomas writes with grace and at times I felt his words reaching my soul like deep waves of the ocean. The reader joins in an adventure with characters who know where they are going. While this is a work of fiction, it is infused with realism and features themes that are not just relevant but urgent, considering the numerous threats related to climate change. The characters are real, deeply human, and confronted with real-life challenges. The writing is composed to make for a great reading experience with sumptuous descriptive passages filled with powerful imagery. The author shows great knowledge of ecology and his voice comes across as something that resonates with the life forms beneath the sea. WhaleSpirit is ingeniously plotted, a work of great imagination. There is no doubt that this novel is enriched by good research because the author writes with unusual ease and clarity.